You set the Screen brightness control of your laptop to some value that suits your eyes but as soon as you start your ubuntu machine then next time, the brightness resets to the maximum value 100%. This issue might be a problem to many as we want to stick with the value to set earlier. There is an easy workaround for this. 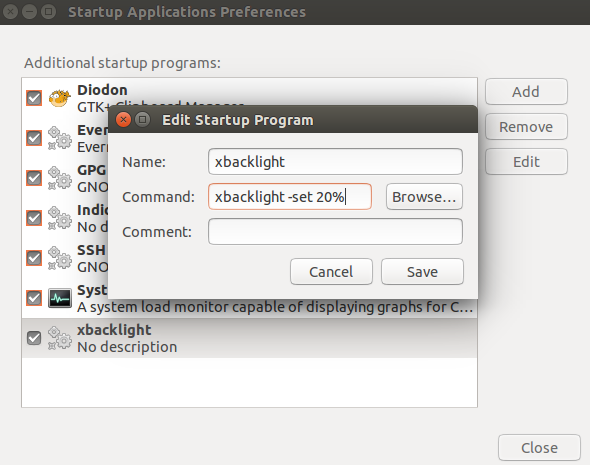 we can use a command line utility named xbacklight and using it fix the brightness to a specific value at every system startup so that you don't have to adjust it every time. 3. Now, click the add button and name it 'xbacklight' or anything and set the command to any desired value like shown in the image below (I prefer it set to 20%). Save it. Done! Restart your laptop to see effect.